Hey, did you hear about the new Harry Potter book? I kid. I was pretty excited myself about the publication of the final book in the series, Harry Potter and the High-Voltage Fence. Vic and I actually planned our trip to South Carolina to coincide with the release date so that we’d be able to read it to each other on the road home. While my dad’s sudden illness kept us from finishing it together, I did reach the end by Tuesday evening. 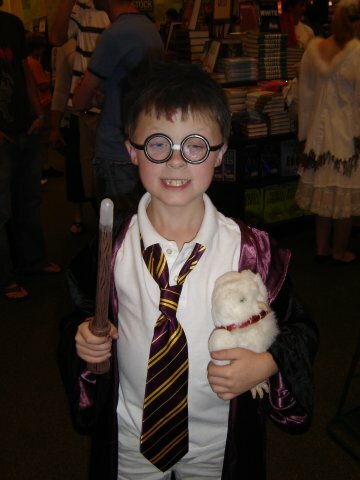 A young wizard from the midnight release party we attended at a South Carolina Barnes & Noble. Happily, I managed to do so before anyone spoiled it for me. Well, except for Stephen Colbert, but I thought he was kidding when he said that Hermione was a dude. Fortunately, no one tipped me to the other big reveals, such as Hagrid’s preference for women’s underthings or Luna Lovegood being crowned queen of the house-elves. And I was completely unprepared to learn that Rita Skeeter is secretly Aunt Petunia in disguise. Oh, I’m sorry, you haven’t read it yet? While there were some kids at the party, I was floored by the number of young adults (one wearing a “Mrs. Amber Weasley” button) and goths. To be serious (if only for a moment), I was truly riveted by the book. While the middle section dragged a bit–even the characters complained about too much time spent in a tent getting nowhere–it was bracketed by fast, furious and deadly action. 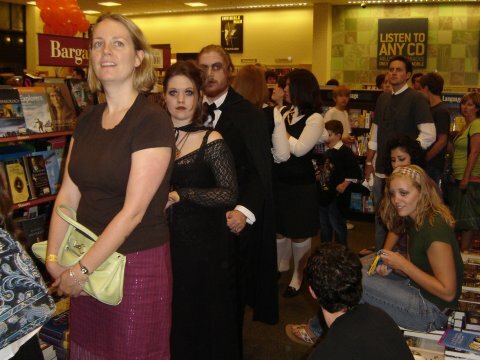 (I especially loved the “Sigourney Weaver moment” involving Bellatrix Lestrange; you’ll know it when you read it.) In addition to the early chase sequence involving dozens of characters, there are two “big heists” and a huge battle involving virtually the entire cast. That last fight is going to make for a very expensive film. 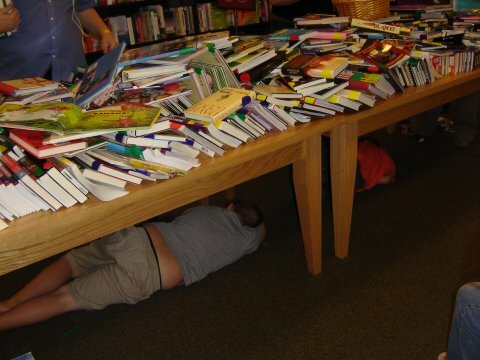 Catching a few zees beneath the bargain books. Some of my pre-release speculation turned out to be right on the money. I was correct about the fates of the major characters, as well as Snape’s allegiance. One thing for which I have to give Rowling credit is that she resists any impulse for a last-second, Darth Vader-esque redemption of Snape. (Don’t worry, that’s not as much of a spoiler as it might appear.) And while Dudley Dursley and Draco Malfoy have their moments of humanity, neither entirely comes around, as I half-expected. One thing about which I was completely wrong regarded the mysterious archway from Harry Potter and the Side-Order of Phoenix, into which Sirius Black fell after being fatally cursed. I had assumed that this was one of those soap-opera “we never found the body” things that would allow for a surprise resurrection, but it seems that to J.K. Rowling, dead is dead. 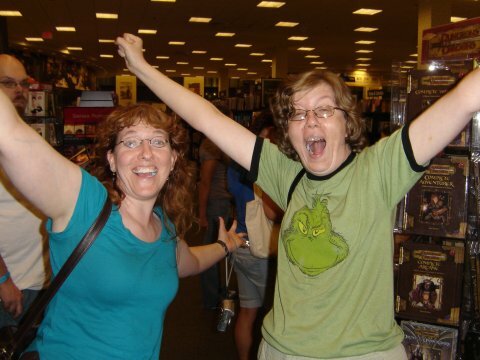 Our friend Christine and my wife Vic feign enthusiasm when their numbers are called. My criticisms of the book–aside from all the time spent in a tent–are few. I still think that Rowling relies too often on entire chapters of exposition. There isn’t nearly as much of Snape as I believe was warranted. And finally, a vital revelation during the big throwdown between Harry and Voldemort relies on the reader recalling a specific event in Book Six, and therefore left me scratching my head at a crucial moment. That said, I’m still satisfied by Harry Potter and the Contractual Obligation. Everything that really needs to be wrapped up has been, and the epilogue left me feeling good. I’m glad that I made it to the end of Harry’s adventures, though I’m hoping that Rowling will one day write a spin-off. Might I suggest Luna Lovegood and the Crumple-Horned Snorkacks?